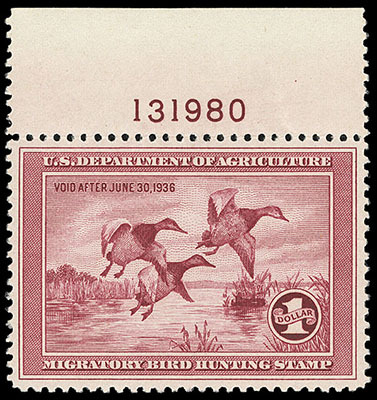 Hunting Permit, 1935, $1 Canvasbacks, top margin single with plate number, o.g., never hinged, rich color, Extremely Fine; with 1990 & 2010 P.F. certificates, the latter Graded (XF 90, SSV $1,100). 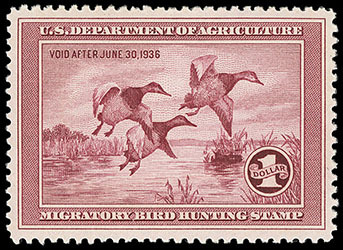 Hunting Permit, 1935, $1 Canvasbacks, o.g., never hinged, beautiful centering and margins, rich deep color, Extremely Fine; with 2011 P.S.E. certificate Graded (XF 90, SMQ $1,100). 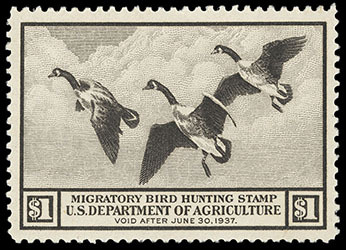 Hunting Permit, 1936, $1 Canada Geese, o.g., never hinged, exceptional centering amid large oversized margins, strong bold color, an Extremely Fine to Superb jumbo; with 2008 P.S.E. certificate Graded (XF-Sup 95J, SMQ $1,250). 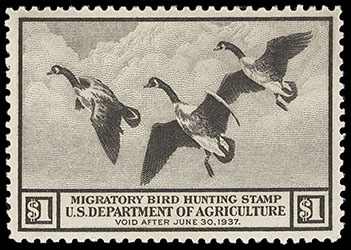 Hunting Permit, 1936, $1 Canada Geese, o.g., never hinged (tiny natural gum wrinkle), large well balanced margins, bright and fresh with rich color, Extremely Fine; with 2003 P.S.E. certificate Graded (XF 90, SMQ $475). 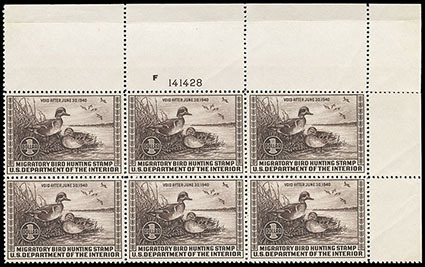 Hunting Permit, 1939, $1 Green-Winged Teals, top right corner margin plate block of 6, o.g., never hinged, nice overall centering, rich color, fresh and Very Fine. 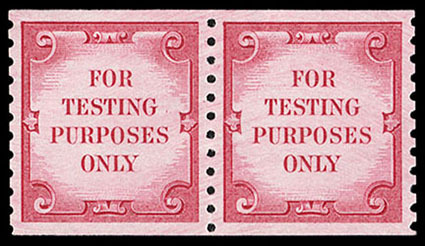 Test Stamp, 1970, B.E.P. "For Testing Purposes Only", carmine, untagged, dull gum, horizontal pair, o.g., never hinged, exceptional centering, pristine, Extremely Fine, a rare key test stamp issue; with 2015 Weiss certificate.